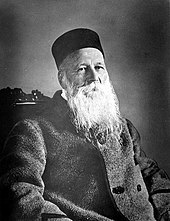 (Jean) Henri Dunant (May 8, 1828 – October 30, 1910) was a Swiss businessman and social activist. His memoir A Memory of Solferino inspired the creation of the International Committee of the Red Cross (ICRC) in 1863, of which he was a founding member. The 1864 Geneva Convention was based on Dunant's ideas. In 1901 he received the first Nobel Peace Prize together with Frédéric Passy. In one of the Cremona hospitals, an Italian doctor had said: "We keep the good things for our friends of the Allied Army, and give our enemies the bare necessities. If they die, so much the worse!" and he added, to excuse these barbarous words, that he had heard from some Italian soldiers who had returned from Verona and Mantua, that the Austrians allowed the wounded of the Franco-Sardinian army to die uncared for. A noble lady of Cremona, Countess..., who had heard the doctor's words and had been devoting herself to the hospitals with the utmost zeal, made haste to show her disapproval by declaring that she gave exactly the same attention to the Austrians as to the Allies, and made no difference between friends and enemies. "For, she said, "Our Lord Jesus Christ made no such distinctions between men in well doing." This page was last edited on 15 April 2018, at 18:53.